Mrs Ben Solo wrote: Anyone read the Leia book yet? It's not out until the 6th here. I'm seeing people saying they've spotted clues for TLJ in there. Amilyn Holdo is in it and we get to know more about her e.g she has brightly coloured hair (green in this book) because the people on her planet dress in a dull way being peace and harmony types. someone may have been watching young Leia as well (like young Ben Solo being watched by Snoke)....Also, one of the Moffs who was a character in the PT suspects Leia is Padme and Anakin's child. It is implied he wanted to tell Palpatine, but he gets killed in an explosion shortly after. someone may have been watching young Leia as well (like young Ben Solo being watched by Snoke)....and one of the Moffs who was a character in the PT suspects Leia is Padme and Anakin's child. It is implied he wanted to tell Palpatine, but he gets killed in an explosion shortly after. After I asked this, I happened upon a Twitter thread of the Star Wars author's panel with Claudia Gray, Delilah S. Dawson and E.K. Johnston at DragonCon. It seems Lucasfilm play their cards very close to their chest with book authors and all information is need-to-know only. Originally, Lucasfilm told Claudia Gray there would be no Han, Luke or Ben in Bloodline but she dug her heels in over Han. https://twitter.com/geek_kay/status/904485505366200324 This is interesting because they might have been intending for Han and Leia's marriage to have been on rockier ground before Ben turned. There are other related tweets if you click on that tweeters timeline. I was at this exact panel an hour ago at DragonCon and I can confirm this!!!! I've been at probably a total of seven or eight SW panels so far (three now with Delilah Dawson, Timothy Zahn, Claudia Gray and EK Johnson), and the ONE take away I can give everyone is that PlotGate is complete bullsith, and an outright lie. The story group is integral to the planning right down to the last minor detail. Claudia Gray stated Friday night in 2015, she wanted to add more to Ben Solo's backstory in Bloodlines. She was told she could not do that because Ben Solo's backstory was already mapped out and would be addressed in future movies. @IoJovi Oh, interesting r.e Claudia wanting to write about Ben Solo. Thanks for the info. Sounds like you've been having a great time at DragonCon. I'm glad to hear you got to meet Claudia and get your book signed. She always seems so lovely on Twitter so it's nice to hear she's like that in real life too. @SkyStar wrote: I was thinking about Holdo and her being Leia's old friend. There have been rumours about Holdo's fight with Poe, also usually Holdo is the first one to suspect with being double agent etc. But how possible it is, if she is a dear friend of Leia? I guess it is possible that her methods could be in conflict with Poe's but really, would she betray Leia? And that is not even if she is capable of, but how much could Leia possibly suffer? This thing bothers me somehow. After Gandalf's betrayal by his old friend and mentor Saruman, nothing would surprise me. How does this work timeline-wise? How old is Holdo in this? I assume they're aging her up to be Leia's age...? - The rebel alliance had members who hedged bets and supported the imperials as well as the rebels. - Pathfinding plays a really big part in the book...now this is something canonically associated Kes Dameron who also taught these survival skills to Poe......but if Leia has done it, could she have sent Ben to learn pathfinding skills as well? Are we getting a bunch of people stranded in the wilderness? - Bail Organa's people have a base on Crait even before Leia was involved with the rebels. - Krennic might have made a small appearance. - Breha Organa is a very interesting and strong character, whose heart and lungs were replaced by a metallic apparatus after an accident. Leia has inherited a lot of her personality. - Leia is attracted to storms....I wonder if this shows some inherent pull between light and dark that extends to Ben as well? - Leia unconsciously uses the force once, but otherwise she seems like a regular girl. - Galatenta is ruled by a Council of Mothers....is this some matriarchal equivalent of the jedi council? I also think it's very interesting that Leia begins to act out as a way to hopefully earn their attention/approval. I wonder if young Ben did something similar? Just finished the book. I thought it as so perfect at tying together all the trilogies and it made me care about things so much more. Also, it was thought-provoking and made me think about the rebellion and the destruction of alderaan in ways i hadn't before. I loved all the connections and none of it felt cheesy. The part with the queen of naboo and Panaka was amazing. Even though Padme's name is never mentioned, I started getting all emotional about how leia was wearing a queen's dress Padme might've worn and becoming friends with someone who was very much like her biological mother was when she was young. The scare with Panaka realizing who she was, but then dying before he could tell the emperor was shocking. Mon Mothma was awesome, as well (all the new canon is doing a great job of showing her importance), and i love seeing the beginning of her working with Leia. mirroring that, I thought the enmity between tarkin and leia was set up very well, too. And I appreciated the mentions of his home planet eriadu. Bail and Breha were wonderfully written, especially breha. Her having the pulmonodes implanted to work for her heart and lungs was a good detail that shows not all people with that kind of stuff are "more machine than man." And I loved the connection to Bloodline at the end! I'm pretty sure Leia's keepsake box she put a lock of kier's hair in is the one with the message that was found in bloodline. Also I thought it was cool when she used the force during one of the path finding exercises without realizing it. Overall, the book made the destruction of alderaan so so much more tragic and meaningful to me. Especially since Kier died to try to save alderaan. And there were lots of cool details about architecture and natural wonders on alderaan. I really want to rewatch ROTS, Rogue One, and ANH after reading this because this book connects them all so well. I'm a ways in and really enjoying this - more than the Phasma book. That one seemed really episodic, actions scenes just happening for the heck of it. But every scene in this book seems to actually be moving the story along. I'm about 1/3 of the way through. I never thought I'd want to see Leia with anyone other than Han, but I'm totally shipping her with Kier in this book. And if it's not too creepy, Kier also reminds me a lot of how Senator Ben Solo tends to be written in AU fanfics. I adore Holdo so far. I almost get the vibe that her character was modeled after Phoebe from Friends. The Holdo that we're seeing in the Leia model does not at all match up with the rumors about her for TLJ. Either the rumors are way off, or something major happened to Holdo between "Leia" and TLJ. Maybe Cliegg Lars is an exception here but he lost a leg before Shmi's death, and even he didn't survive for too long after this event. 2.Female leads have two relationships, and the first lover dies young. Padme: dates Rush Clovis; Rush dies young. Marries Anakin. Leia: dates Kier Domadi; Kier dies young. Marries Han. @ISeeAnIsland wrote: I'm about 1/3 of the way through. I never thought I'd want to see Leia with anyone other than Han, but I'm totally shipping her with Kier in this book. And if it's not too creepy, Kier also reminds me a lot of how Senator Ben Solo tends to be written in AU fanfics. Thank you! I am not finished either, but I freaking love Kier. I totally think he is Ben Soloesque with the dark hair, intense dark eyes and intelligent, studious, shy and awkward nature. He's totally like what Ben could have been had his childhood not been such a cluster. He's described so much like Adam Driver that for a second I thought, "wait, is Ben the reincarnation of Kier?" Lol!!! But OMG yeah, I totally ship a Leia and Kier. Also, though I am not finished, this book is just as tragic as hell. Leia is so innocent and almost sweet and yet already stuff is happening to her that is going to jade and scar her. Kier keeps encouraging her to have her own life, to not take the world on her shoulders, to have fun, and you know that this book is full of stolen moments that will never happen again. Holdo also gives her good advice. (Holdo is like the Luna Lovegoode of SW, lol). She tells her how she has to have joy in her life so she doesn't get burned out, so she has the strength to take hardships. I get the feeling she never really learned how to have fun and just live in the moment and that didn't help in her raising of Ben. He seems like he would be a naturally intense kid who would have benefited by things not being serious all the time. Right? I remember how Claudia Gray kept Tom Hiddleson in mind when describing Ransolm Casterfo, and I wonder if she had Adam in mind as she described Kier. She even mentioned his "angular" facial features and the somewhat divisiveness as far as whether someone would call him "handsome" or not. I seem to remember Kier being described as being dark skinned? 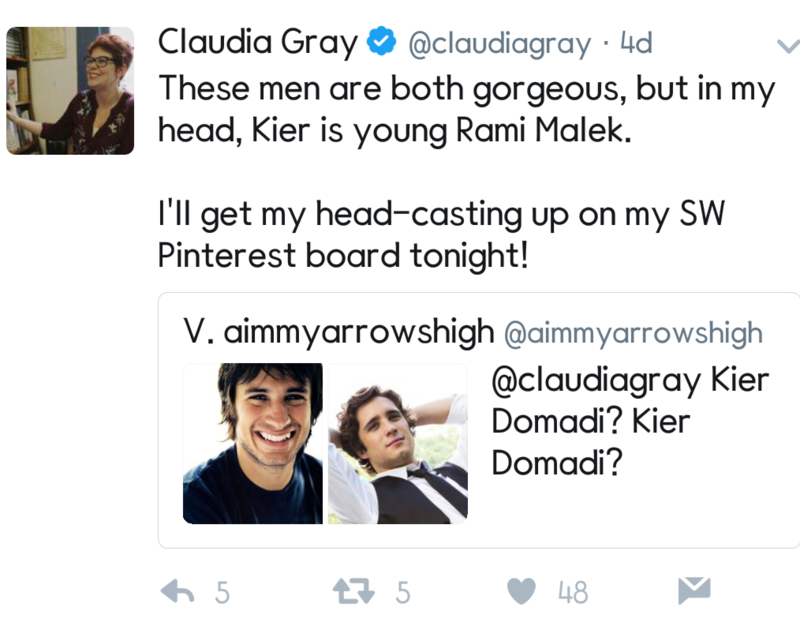 But Claudia did tweet that she had Rami Malek in mind when she wrote him. I will have to look it up, but I don't remember Kier being described as dark-skinned. I thought he was in the "golden" skin category. Also, it's interesting that she says he's Rami Malek when at the same time the book makes a point of saying Kier is tall, has angular features and a long face, when Rami Malek isn't that tall, doesn't have angular features, nor a long face. Tbh, I think she totally thought of a tan Adam Driver, but isn't going to say she thought of Adam Driver because people would make a big deal of Leia dating someone who looked like her future son. But in the end, there is too much ... the commentary on his intense eyes, the angular features, the handsome or not thing, the awkwardness, the distinctive voice, the whole soulful "I'll do anything for you" vibe, etc. ... for me not to think that Kier is written as an analogue for Ben, who Ben could have been without the force, Snoke, distracted parents, Luke, etc. because Kier died trying to save her, because her impulsiveness backfired terribly (the whole Wobani thing, being hellbent on getting involved in the Rebellion, telling Kier things when he had given her plenty of reason to believe he was not on the exact same page politically with her, that he had his own legitimate, yet distinct point of view, but would do anything for her), that she never found that "strength through joy", that balance of valuing emotional needs and of living in the moment along with her political beliefs and duty, that Holdo and Kier tried to impart to her, and as a result, just went headlong into "the fight" after Kier died and could never, ever, leave it ... even when she had her own baby. One of things that is so sad for her and Ben is that she seemed to have an excellent relationship with her parents for the first 16 years of her life. But still she was devastated when she thought they were ignoring her. Even when she learned the reason it was hard for her to transition to the new family paradigm. But at least when she and her parents went all out on the rebellion and put emotional needs aside, she was old enough to understand it and had had 16 years of very good, attentive life with them, *and* in the end through honesty and facing issues head on, she and her parents ended up in a good place and on the same page as each other. Unfortunately, it seems like Ben never got such an attentive 16 years, nor was there an open and honest relationship because of Leia's denial about Vader and probably her and Han's fears about the force. As a result, Ben might have felt ignored much younger, when he was still developing, and just didn't have the tools to handle it, even though in Leia's mind I am sure she thought her work for the galaxy was very much for him. Also, because Leia got thrown into "the fight" in such a traumatic way, ripping her from childhood in the most horrible way, followed by ever worsening, unspeakable tragedies, there was probably no way she would have the tools to even be capable of "not fighting". In fact, this book shows that at her heart she is pretty sensitive (much like Ben probably was), but she learned to survive these things by swallowing her emotions, by turning into that "crystal". The problem is that Ben probably needed more than the "crystal". He probably needed somebody that he could connect with in that super sensitive emotional way ... but because Leia had become so devastated over Kier and because she continued to experience more and more mind-boggling tragedy, she was probably terrified of really "feeling" too much for fear that she would completely fall apart and never be able to pull herself together again. The whole thing is so sad because I get the feeling that she and Ben are probably very much alike, but that by the time he came along she had been so damaged and had so many walls up that neither one could ever get close enough to realizing how similar they might be. Yeah and I don't find Rami Malek's looks 'devisive'. I think he's pretty cute. But tbh I personally didn't find her romance with Kier to be particularly interesting until the very end when it ended in tragedy for Leia. But this I know. Leia's life can't be all about tragedy. Ben has to come home again. I always assumed Kier was tanned, not fair complexioned based on his description......Handsome with angular features, dark hair, very tall, golden complexioned, into politics and wanting to do the right thing, including dying for it......that sounds exactly like Padme's old boyfriend Rush Clovis (I got more of a Ben Solo vibe from Leia when it came to her relationship with her parents, responsibilities, rebellious streak. Kier seems to care more about rules and convention). Looks like Leia was following her mother's footsteps when it came to boyfriends. The novel actually made me wonder whether Ben Solo turned to the dark side after losing someone he cared about? I can't wait for my copy to arrive! Amazon should send it this week... please hurry! Why isn't it available as kindle edition in the first place? Maybe it's a regional thing? It's available on Kindle in the US. @ISeeAnIsland wrote: Maybe it's a regional thing? It's available on Kindle in the US. That is a huge bummer. What about the UK site? Can you get through to that one? I think that people have bought it through them. Also, there is an American company I use called Barnes and Noble. It's bn.com and you can download through them via their Nook app. I have a discount membership though them, so I buy from them, and in fact, they had Bloodline available when Amazon still had it in preorder mode. So it might be worth a try. thank you very much for the pointer! I'll check it out today!